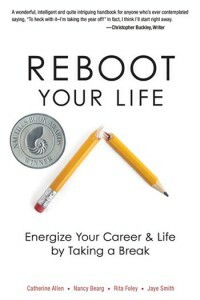 Reboot Your Life™ programs assist executives in identifying what in identifying what they want, and need, to do to build a sustainable plan for reinvention in the next chapter of their lives, whether mid-career or pre-retirement. We sacrifice many aspects of ourselves to be successful executives. By rebooting, we get back in touch with the core of what makes us happy, taps into our passions, and reconnects us with the broader aspects of ourselves. Reinventing then is the planful moving into a next chapter of life that incorporates our past with what we have discovered about our core passions. Breakwater Consulting in partnership with Reboot Partners LLC – authors of the book Reboot Your Life: Energize Your Career and Life by Taking a Break (2011, Beaufort Books) – provides resources to small groups and corporations, providing solutions for re-engaging employees, career mobility, and retirement-planning. Reboot Break™ Programs – People who take sabbaticals (or “Reboot Breaks”) report feeling happier, and they return to their job refreshed, reinvigorated, and ready to tackle new challenges. Our Reboot Break programs are designed to benefit your bottom line by working with you to create leadership development programs, support positive career transitions, and encourage employees to “step up” through enriching external experiences. Reinventing Retirement Programs – 60% of Baby Boomers go directly from fulltime employment to fulltime retirement. For many, the transition into this next life chapter will be a challenge, especially if the transition comes suddenly. We can help your organization ease your employees’ planning and shift into retirement or whatever the next chapter may be, so they can stay focused on their job until they leave and be successful afterward.